Tomorrow I'll be taking a break from the business of exam revision to see a show by the amazing dabkeh group al Zaytounah, this will be my third show and if it is anything like the previous two then I expect it to be excellent. If you can, do try and come. Tickets are still available from their website. 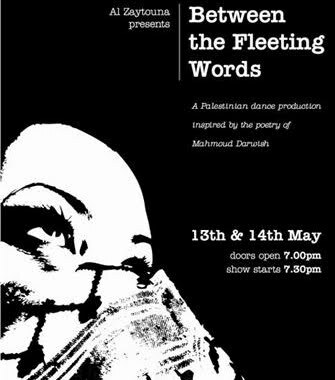 Al Zaytouna is proud to present a new full-length production entitled Between the Fleeting Words, directed by Ahmed Masoud. The production fuses traditional dabke, contemporary dance, poetry, music and digital media. The show is a unique tribute to the work of the late great Palestinian poet Mahmoud Darwish, celebrating his poetry and the musical interpretations of his work, and using his words to tell the story of Palestine through the experiences of its people. The show also commemorates the 62nd anniversary of the Nakba and explores themes of identity, struggle, loss and resistance. Renowned Palestinian musician, singer & Oud master Nizar Al-Issa will be joining to play some of his distinguished traditional Middle Eastern music.